I love a warm, cozy drink on a chilly day! I can drink coffee year-round, but hot chocolate and hot apple cider are reserved for the winter months for me. Many winter nights you'll find me on the sofa with Harry curled up beside me (he likes to curl around with his head against my leg or on the sofa cushion), drinking a hot beverage and watching TV. Harry keeping an eye on me. He loves to have his head on a pillow or against me! I haven't tried making hot apple cider from scratch yet, but I have been tinkering around with variations of hot chocolate and came up with this Chocolate-Covered Cherry Hot Chocolate that I just had to share! Chocolate and cherries - a wonderful combination of two antioxidant-rich foods! 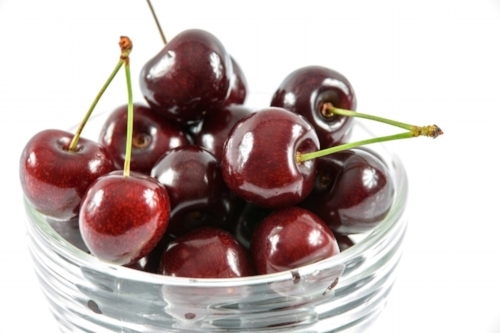 Cherries are high in anthocyanins, a type of phytochemical which has both antioxidant and anti-inflammatory effects. (Many athletes drink cherry juice to help with muscle recovery). In laboratory studies, anthocyanins have been found to inhibit the growth of cancer cells and even promote their self-destruction (www.aicr.org). Anthocyanins also give cherries their beautiful, rich red color. If you're searching for a nourishing drink to warm you up, try this Chocolate-Covered Cherry Hot Chocolate! Combine cocoa powder, sugar and salt in a medium-sized saucepan. Over medium heat, whisk in about ¼ cup milk, stirring until combined. Add the remainder of the milk and cherry juice and heat stirring occasionally for about 5 minutes. Remove from heat, add vanilla, stir and serve!